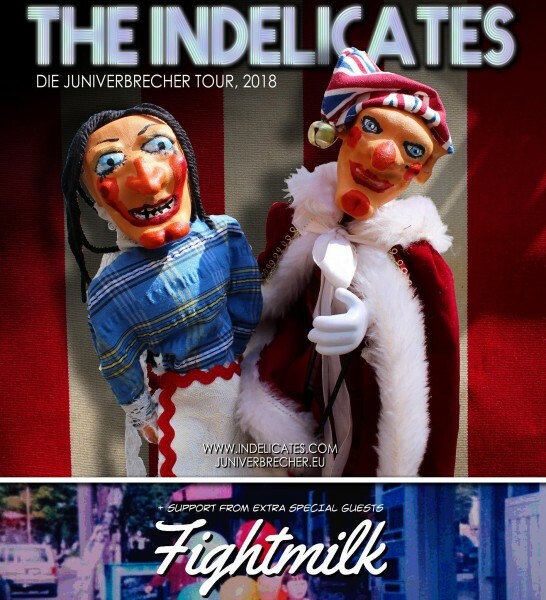 Paper Dress Presents: The Indelicates + Fightmilk + Keith TOTP! The Indelicates consumer lifestyle brand is the family business of Simon and Julia Indelicate, a Mom and Pop enterprise based in Lewes, a small town in Western Europe. The band first performed at the peak of the landfill indie craze that nobody remembers fondly in 2005 and released their debut album, American Demo, on some record label or other in 2008. Luckily, the music industry promptly collapsed completely and they managed to rescue their minor back catalogue from the wreckage. Unwilling to be deterred by mere financial calamity they immediately started work on Songs For Swinging Lovers, their easy second album. Since then, the list of things they have invented includes: Crowdfunding, Virtual Reality Music Videos, Living Room concerts, Gamergate, Being against Romantic Nationalism, Bandcamp, Super Special Editions, Footnoted lyric books, The New DIY and a range of puppets. Having done all of these things first, it has fallen to other people to be successful with them. And that’s absolutely fine. They released their sixth studio album in 2017. It’s called Juniverbrecher and is about banishing the Jimmy Savile/Mr. Punch/ Brexit demon who – they have realised – is the one who is doing it.